8 pages. Volume 4, Number 8, dated April 21, 1978. Newsletter / bulletin originally mailed-out to amusement game operators, providing updated info about the coin-op industry. A great historic insight to the industry of the time. 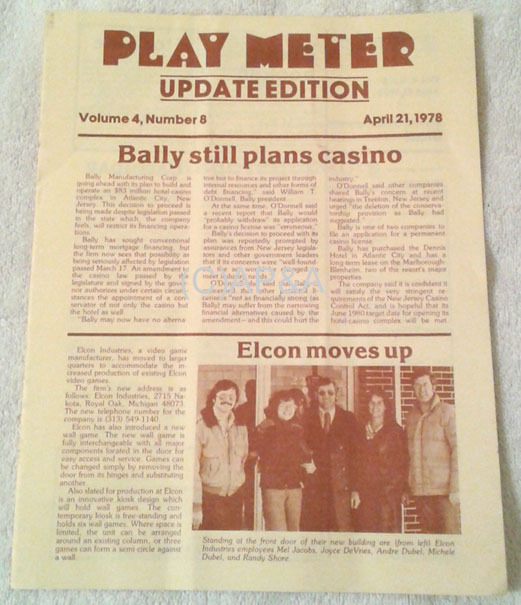 This edition includes information about Bally opening their first casino/hotel in Atlantic City, New Jersey, Gottlieb opening a 'solid state' telephone hotline for support on electronic games, voltage regulator tech info, juke box updates, tech info and tips, classified ads, and for juke box operators- a listing of the top 100 record/singles- pop, soul, and country for the time ("Night Fever" by the Bee Gees being listed as the 4th week at the top position). Original newsletter in excellent condition. Operator's address label present on back.